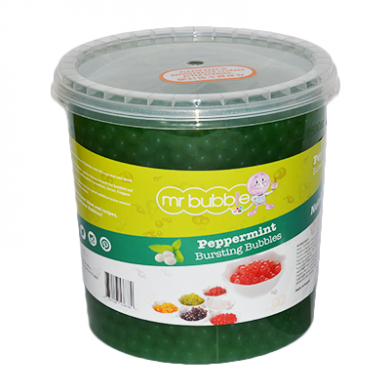 Peppermint bursting bubbles are juice-filled bubbles which pop under gentle pressure for a flavoured taste sensation! Ideal for making bubble tea or try adding them to cocktails, or as a dessert topping. The bubbles are a guaranteed hit with children, and we know that when adults try them too they are instantly hooked too. Our bubbles have a firm jelly shell with a juice syrup centre. 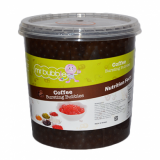 Traditional bubbles are made from chewy tapioca and don't have a liquid centre like ours. Scoop the required amount of bubbles into the cup and add drink of your choice. Suitable for use with: slush drinks, milkshakes, smoothies, juices, frappes and add any other cold drinks. No preparation - just add to your drink or dish. Perfect for making bubble tea, cocktails, milkshakes etc. Great as a topping for ice creams and sundae's. Mr Bubble is a brand of Mr Bubble Drinks Ltd, a Hampshire based business specialising in juice bubbles for milk shakes, ice cream and cocktails. Storage Instructions: Ambient - cool and dry. Once opened, use within one month and keep refrigerated.